7:30 Woke up after 7,5 hours of sleep, turned around and slept until 10:30. 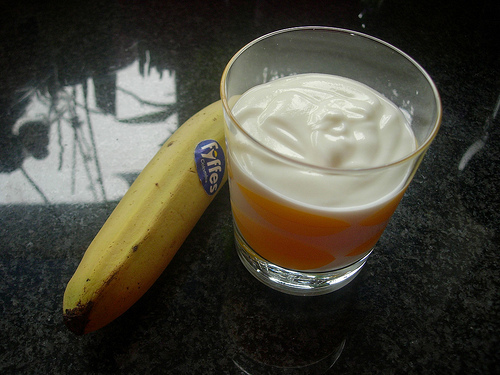 11:30 Breakfast: A banana and a glass of yoghurt. 13:00 My brother-in-law, my husband’s twin brother, came by with his 6-year-old daughter and his 4 1/2-year-old son. So the cousins could play together today. 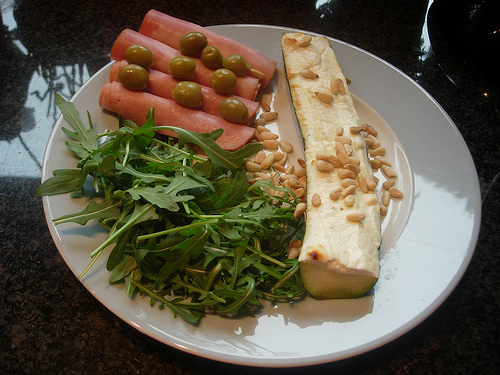 13:15 Lunch: Zucchini topped with a mix of quark and goat’s cheese, served with arugula, green olives, smoked ham and pine nuts. 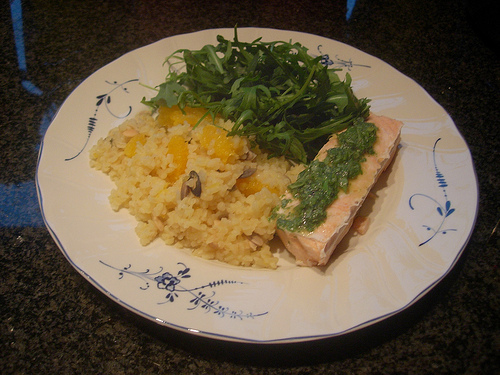 17:45 Dinner: Salmon with a sauce made from basil, extra virgin olive oil and red vinegar, served with bulgur, orange, pumpkin seeds and arugula. 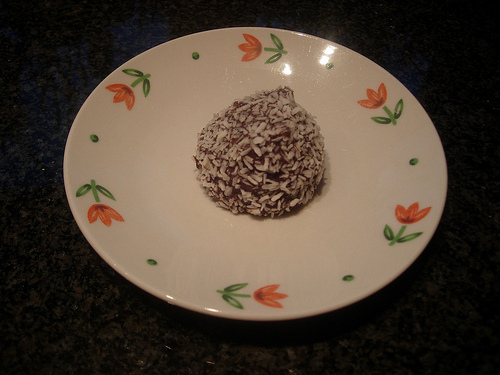 For dessert we had Delicato balls from IKEA. During the day I had 4 cups of green tea and after dinner I had some mint tea. This entry was posted in food, life and tagged 10.5 hours of sleep, 4 1/2-year-old, 4 1/2-year-old son, 6-year-old, 6-year-old daughter, 7.5 hours of sleep, arugula, banana, basil, breakfast, brother-in-law, bulgur, cousins, daughter, Delicato balls, dessert, dinner, extra virgin olive oil, goat's cheese, green olives, green tea, ham, husband, IKEA, lunch, mint tea, olive oil, olives, orange, pine nuts, play, play together, pumpkin seeds, quark, red vinegar, salmon, smoked ham, son, tea, twin brother, yoghurt, zucchini. Bookmark the permalink.